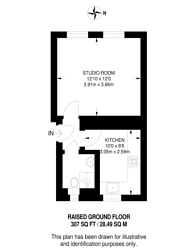 This superb studio flat is situated on the raised ground floor of a smart residential building close to a wide variety of fashionable amenities. There are a good selection of local amenities on Goodge Street and Great Portland Street while Oxford Street and Tottenham Court Road offer a more comprehensive range of shops, bars and restaurants. The perfect pub for a post-work drink in central London along Great Titchfield Street. It also serves food and Sunday lunch. The best tailors in Europe. Bespoke or off the rail, there's something for everyone's budget. 307 (28 Sq M) approx. We have over 1,000 property market reports for locations across London and Surrey - including W1 and Fitzrovia.